It’s Christmas season! Family traditions, a friendly contest or other incentives drive neighborhoods to string Christmas lights each year. The best time for hanging Christmas and outdoor holiday lights is before your weather turns wet and cold. Not only is it easier and more comfortable to work outdoors in mild weather, but it is also safer. Safely climbing ladders and working along the eaves of a roof can be a dangerous challenge in bad weather! There is a huge variety of Christmas lights and displays for the rooftop, but few people actually consider the effect of Christmas lights on their roof and gutter systems. Your roof is designed to withstand mother nature and to keep you safe from the weather year-round. Regular inspections from your trusted roofing professional are crucial to keeping your roof in superior condition. So, before stringing Christmas lights, climbing on the roof, or putting any pressure on your roof system, make sure that it your roof is able to withstand the activity. A first step is to call a professional from Greenawalt Roofing – our experienced roofing experts are trained to inspect roofs in a safe manner and find any small and big problems before they become a major (and expensive!) headache. An inspection should be done before Christmas lights are hung to ensure that the roof is stable to hold additional pressure. Homeowners should be cautious stringing lights or putting any displays on their roofing structure. An inspection can determine where any soft spots are in the roof and to find out if there are any leaks, cracks, or loose shingles. During the inspection, have a roofing professional look at specific areas, such as the chimney and gutters, where the Christmas lights will be hung. 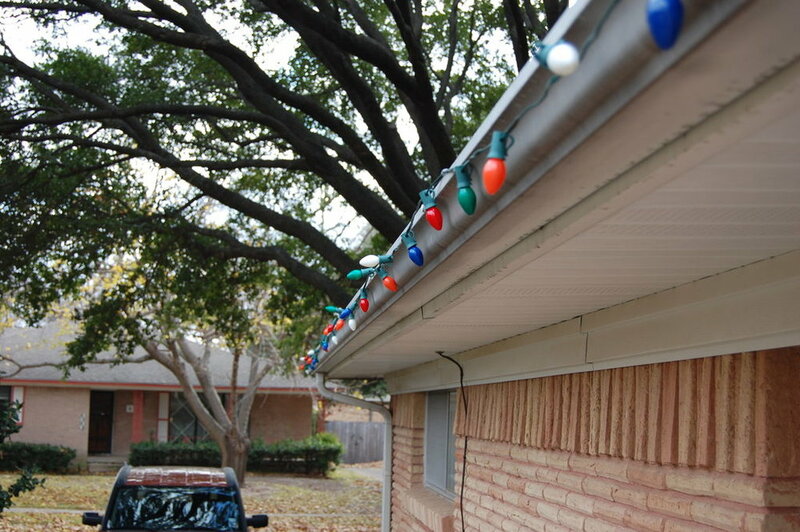 If you have loose gutters, this could pose a serious threat to the safety of the person stringing the lights. A steep roof pitch can be dangerous to those who are untrained walking on them. When hanging Christmas lights, it is important to preserve the roof structure. There are a variety of methods used to install Christmas lights without permanently attaching, or nailing, the lights to the roof structure. First, consider gutter clips. Gutter clips are designed to lightly hang from the gutter, without putting too much weight on the system. This is safe for the gutter and still allows for a nice display. For more ornate Christmas displays, consider magnetic Christmas lights. It simply clips onto the shingles and can be removed. Velcro clips are another temporary attachment. Consider options that are temporary and cannot puncture or crack your roof system. Once the holiday season is complete, the cleanup is fast and easy!